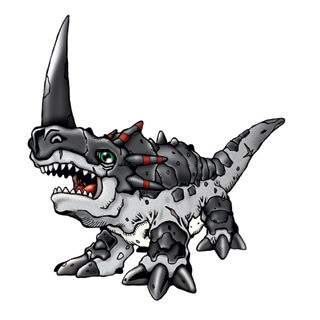 An Ankylosaur Digimon that has grown a rhinoceros-like horn on its snout. Its huge horn becomes large enough to account for half of its body length as it grows. The hard substance covering parts of its horn and half its body possesses hardness of the same quality as diamond, and it is said that there is nothing that cannot be penetrated by this horn. Monochromon can be said to be a Digimon that excels in both offense and defense. As it is herbivorous, it has a relatively docile personality, but once it is angered, it will continue to unleash terrifying counterattacks from its body like a heavy tank. Its Special Move is a powerful flame shot (Volcano Strike). 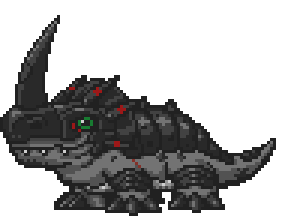 An Ankylosaur Digimon that has a horn as hard as diamond. It is normally gentle, but once it gets angry it will charge at the opponent until it is defeated. — Digimon Adventure: "The Blue Wolf! 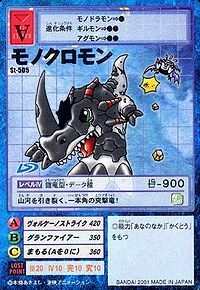 Garurumon"
An Adult level Digimon that has horns and a body as hard as diamond. Its Special Move is a high temperature fireball (Volcano Strike). — Digimon Adventure 02: "The One who Inherits Courage"
| Monochro is short for monochrome (「モノクローム」 Monokurōmu), which means all one color. 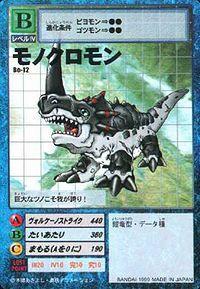 | Monochro is a corrupted misspelling of monoclo, from Monoclonius (「モノクロニアス」 Monokuroniasu), which is a single horned dinosaur similiar to a Triceratops. Anime/Manga Digimon Adventure V-Tamer 01: "The 5 Trials!!" ヴォルケーノストライク Vorukēno Sutoraiku Volcanic Strike Spits out a ball of volcanic fire. グランファイアー Guran Faiā Big Blaze Breathes out a wave of fire that sweeps along the ground. ガーディタスク Gādi Tasuku Guarding Tusk Charges forward and spears the foe with his horn. While exploring File Island, the Chosen Children came across two wild Monochromon who were fighting over territory. They ended up falling of a cliff. Some later appeared in the service of Etemon where they pulled his caravan around. The Digimon Kaiser sent a Monochromon to attack the Chosen Children when they first arrived in the Digital World. Its Evil Ring was destroyed by Fladramon. A Monochromon is the partner of Chichos. 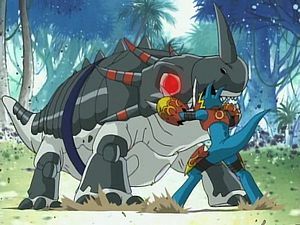 A Mochochromon is pictured as one of the Digimon killed by Kurata Akihiro's forces. 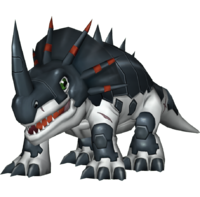 Monochromon appears as an obtainable Adult-level Data type Digimon in Digimon World. At the entrance of the Great Canyon the Player will see the Monochrome Shop, a convenience store managed by a Monochromon that sells Meat, Portable Potties and Medicine. Monochromon will hire the Player as a test and see if its worth joining the Village of Beginnings. So, the player has to sell the aforementioned 3 items to various Digimon, which they include Goburimon, Gotsumon, Weedmon and Muchomon. The Player needs to earn a total profit of 3,000 BITs in order to have Monochromon join, the Player has to negotiate the client Digimon, if the price is too high, the Digimon won't end up buying anything and if the price is too low, the Player won't be making any profit. After Monochromon is recruited, it will join alongside Unimon, Patamon and Piyomon in the Item Shop. 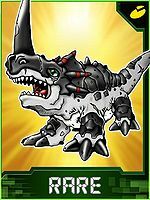 If Monochromon is the third Digimon of the aforementioned ones to be recruited, a Card Machine will appear, and if Monochromon was the first Digimon to be recruited, it'll build the Item Shop instead. When the Secret Item Shop has been unlocked, Monochromon's schedule will coincide that to Devimon's, working from evening to early morning. Another Monochromon NPC is found in the Glacial Time Zone, where it, although won't join the city, it will talk about another Monochromon working in the Great Canyon. Monochromon's Digivolution item is the Mono Stone which lets any Child Digimon evolve into Monochromon. Four columns of fire surround Monochromon, then it spits out a burning boulder towards the enemy. Monochromon is an obtainable Digimon. Evolves from Elecmon (6+ DP) and can evolve to Vermillimon (0+ DP). Can be evolved from Agumon (Black) if above level 19 and Dragon EXP 220. Can evolve to Vermillimon if above level 37, defense 175, and Dragon EXP 3500. 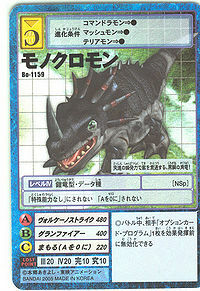 Evolves from Armadimon or Agumon (Black). 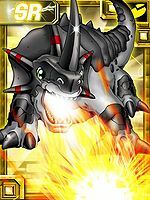 Can evolve to Metal Tyranomon, Triceramon or Skull Greymon. Monochromon is a non-obtainable enemy Digimon. Monochromon is available as a Digimon Medal. 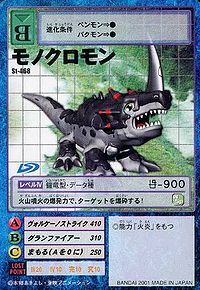 Monochromon is available as a Digimon Card. Evolves from Piyomon. Can evolve to Megadramon. Evolves from Gottsumon. 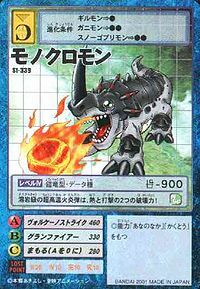 Can evolve to Triceramon or be Jogressed with a compatible Digimon to get Jyagamon, Piccolomon or Tonosama Gekomon. Evolves from Gottsumon. 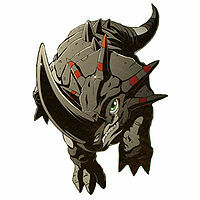 Can evolve to Triceramon or be Jogressed with a compatible Digimon to get Angewomon, Piccolomon or Tonosama Gekomon. 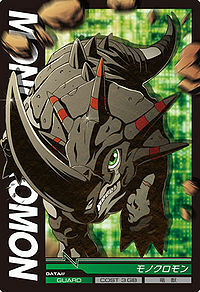 Monochromon is an enemy Digimon in Area 02 and 03. Appears in Area 02 and Area 03 as a wild enemy encounter. Its lava-like super hot fireball destroys with both heat and shock! It blasts its target with the explosive power of a volcanic eruption! This single-horned assault dragon tears up its surroundings! My giant horn is my pride! This black-steel horned dragon pierces its enemies with its explosive charges! It possesses a horn and carapace as hard as diamond. It is said that its horn is capable of growing to half its body length. It is herbivorous and usually docile, but will start rampaging when it is angered.